A model I am not; a mega fan of Michelle Starbuck Designs I am. So it was pretty much the coolest thing ever when my favorite Chicago jewelry maker asked if I would be her fall look book model. Dream gig! 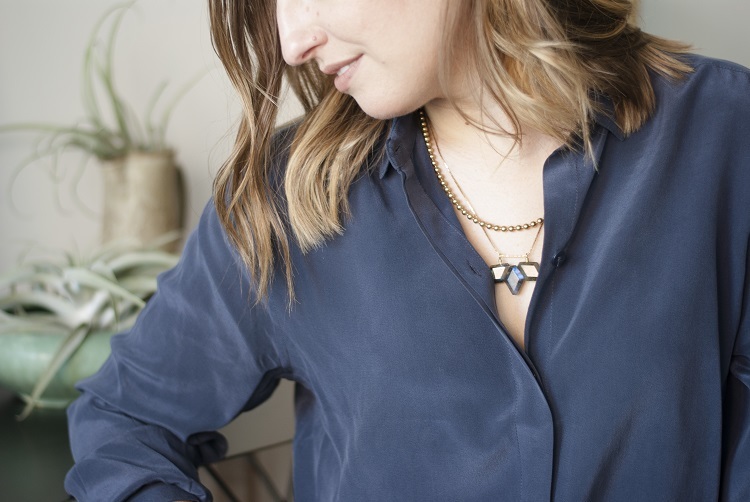 Back in June, we got together with Emily Prendergast of Maya Mueble to photograph her beautiful jewels. 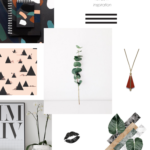 I love Michelle’s simple geometric designs and how she incorporates stones into her pieces. I cannot wait to wear my favorite pieces from the collection and Michelle is also giving away a Reiden Necklace to one of you! Here’s a peek at some of my favorite looks! Details on how to enter the giveaway are at the end of the post. 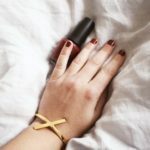 I get major 70s vibes from the Parcel bracelet. I love how it drapes around the wrist. Blue looks pretty good on blue, don’t you think? I can see wearing both of these with cozy fall knits. Cannot wait to accent my collection of grey sweaters with these blues! Wearing the Primer and Shift necklaces and the Shift bracelet. Statement earrings! 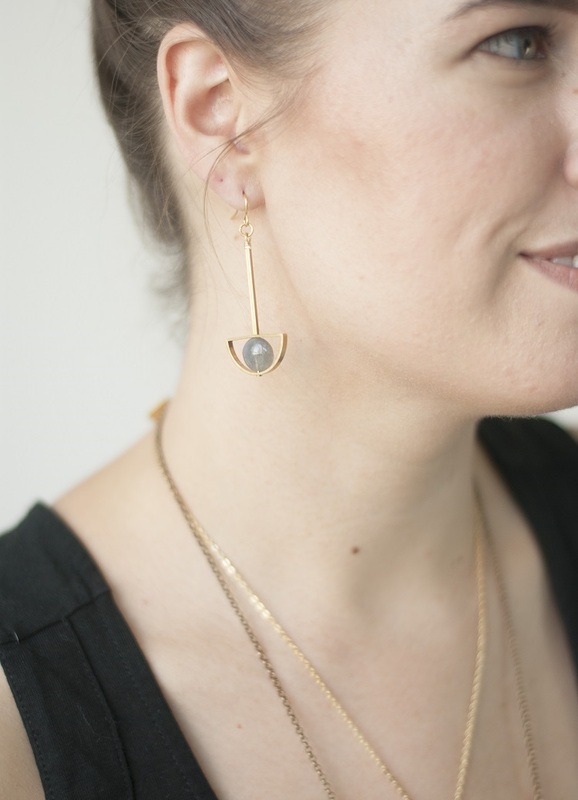 The labradorite stone in the Eye Drop earrings is beautiful. I like to dress up my ears when I wear my hair up. Party in the back! I mean, you could. 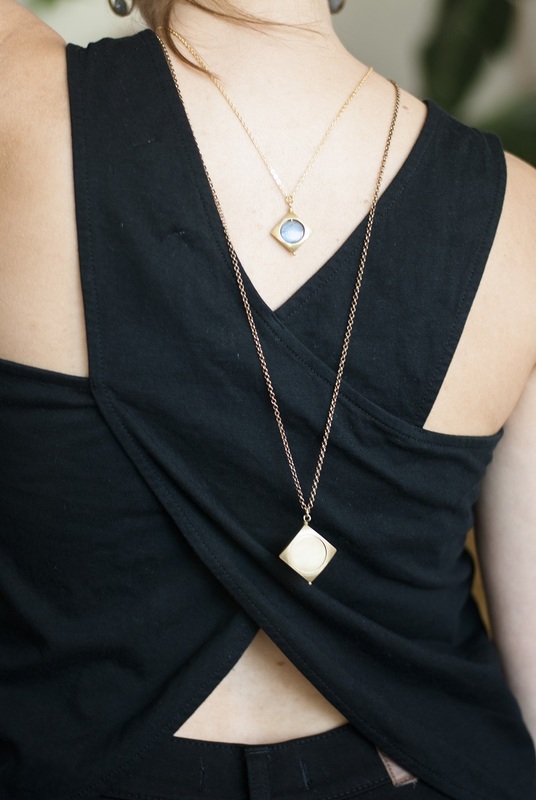 Love the backside take on the Mini Vega and longer Brass Vega necklaces layered. One awesome thing Michelle always does with her necklaces is allow you to customize the chain length. After seeing a few pieces with labradorite, aren’t you just loving how it always takes on a different look depending on what you’re wearing? The Reiden Necklace is really special and I’m so thankful to Michelle for giving one away to you guys. You can enter through Rafflecopter below – there are a few ways to get more entries. The giveaway will close on August 19 and (1) winner will be notified next weekend. At this time, we can only ship to the U.S. Good luck! All photos in this post taken by Emily Prendergast of Maya Mueble. My favorite in the fall collection is the mini theorem necklace. Beautiful! I love the reiden necklace. favorite for fall. those statement earrings! wow. 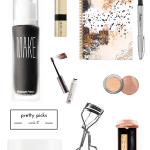 perfect for a topknot day (or week…). I love all the Labradorite used in this collection! I’m gaga over the sodalite Theorem Necklace. So gorgeous. I love the brass vega necklace from the new fall collection! It is perfect for layering! 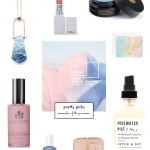 My favorite is the Primer Necklace ! Loving all the beautiful blues in this collection! The mini theorem necklace/lapis is my favorite. I plan on purchasing tonight! 15% off ends Sunday. 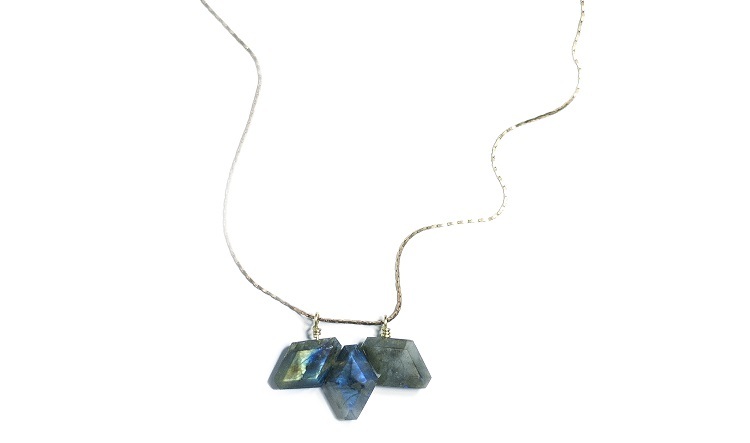 I love the reiden necklace – love labradorite in general, but this is so unique! So many beautiful designs! I really like the Onyx Elder Necklace. 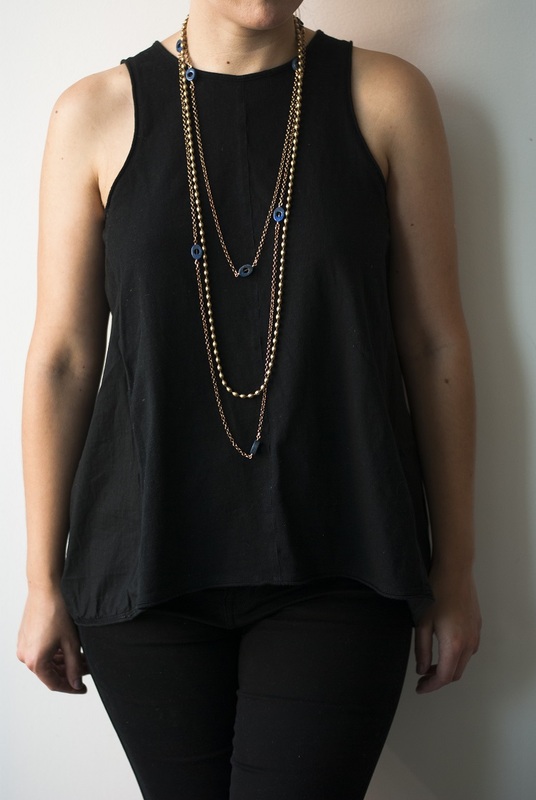 Loving the Mini Vega and Brass Vega necklaces layered in the back! I would wear them individually too in the front. Beautiful. 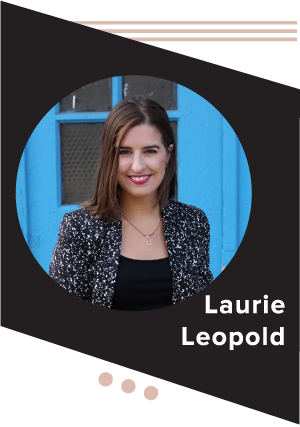 I love the lapis monolith earrings and the reiden necklace – labradorite is the best! The Amulet necklace in Labradorite is lovely. 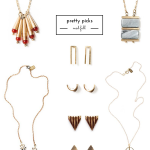 After looking through, I think you made a great choice – Reiden Necklace is my fav! 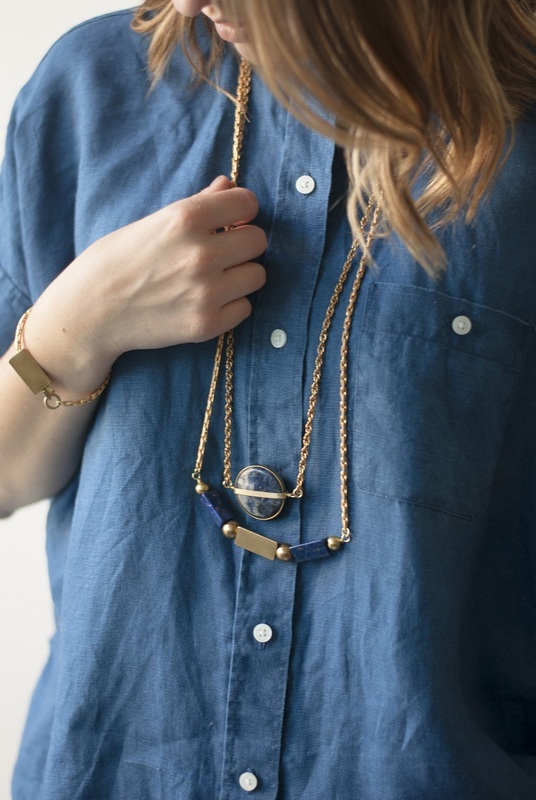 I LOVE the Primer Necklace / Sodalite! Totally unique, amazing color – love it! The Reiden Necklace is my favorite, but i am loving this color story! I need to add more to my collection! As always, it’s so hard to choose a favorite, but I’d say the Eye Drop earrings and the Vega necklace are decided favorites!